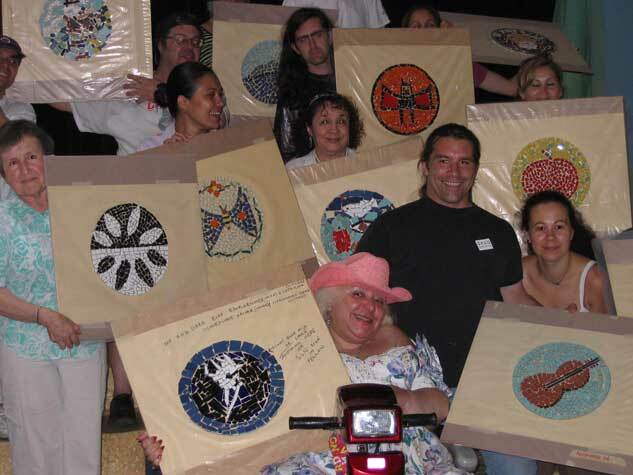 In Fall 2001, Jumblies embarked on our first full multi-year resideny, with the vision of moving through phases of Research and Development, Legacy/Sustainability. 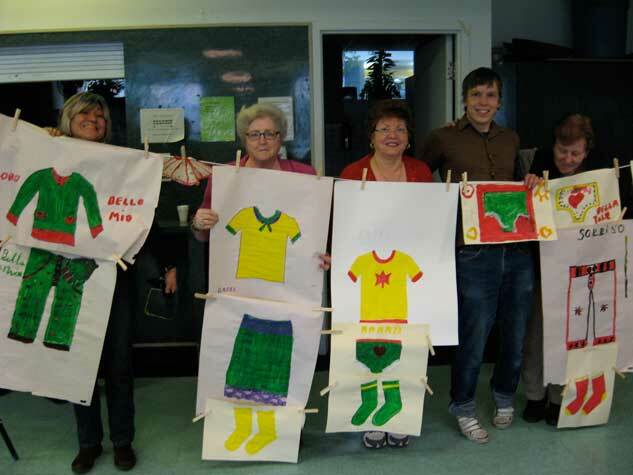 Ruth Howard and Jumblies were hired by Keith McNair and Davenport Perth Neighbourhood Centre (DPNC), initially on Ontario Trillium Foundation funds, to establish ongoing community arts activities for the centre and surrounding neighbourhood. 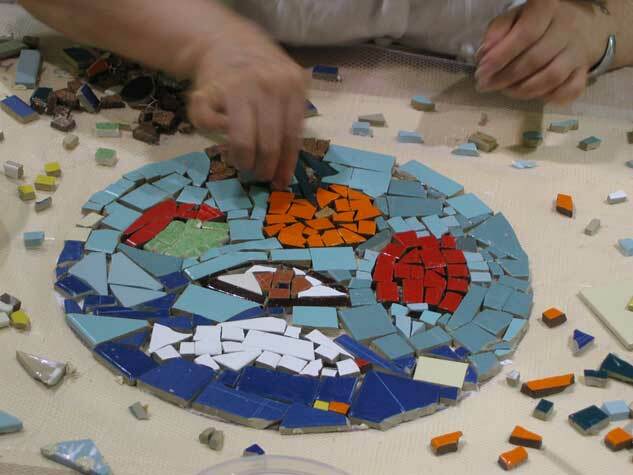 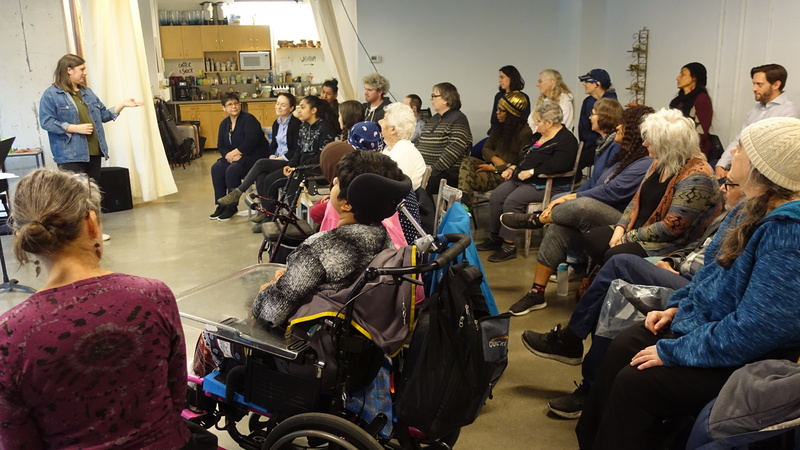 We named the Initiative Arts For All, and, during its first year, undertook a variety of creative activities with different artists, art forms and community members and groups to learn about the people and place. 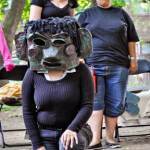 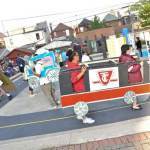 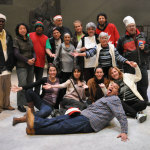 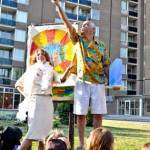 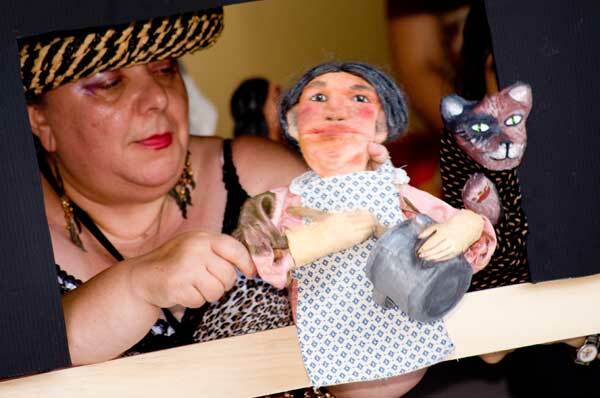 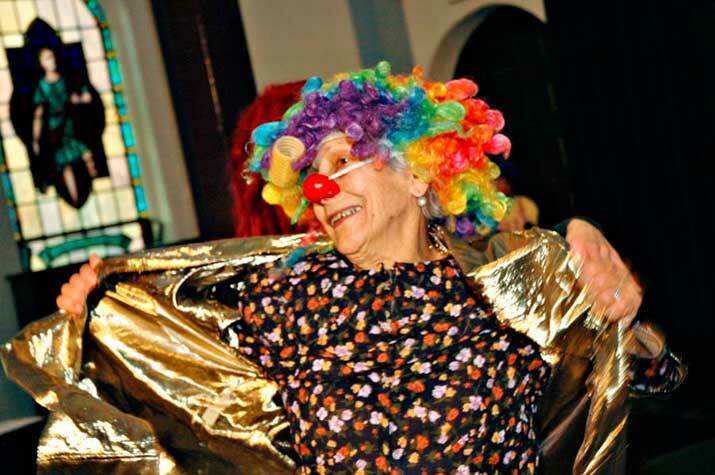 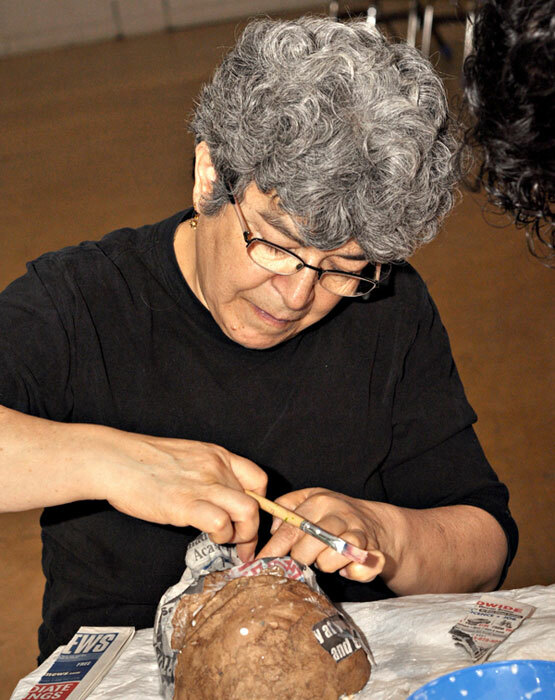 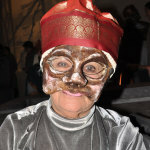 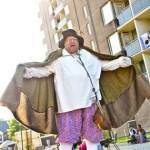 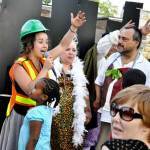 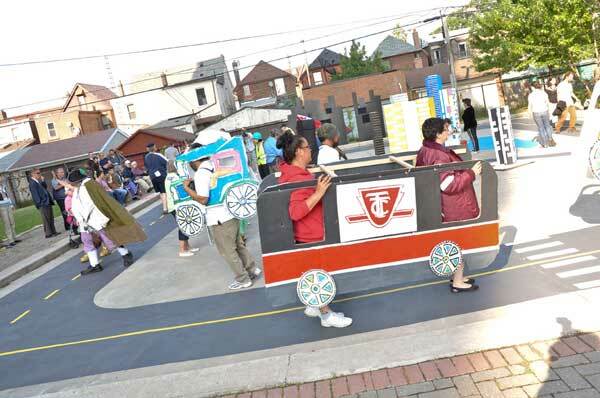 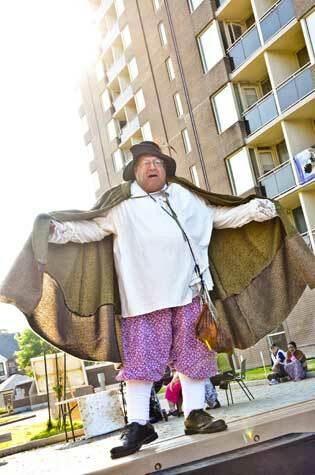 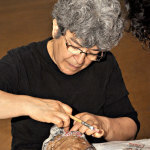 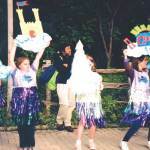 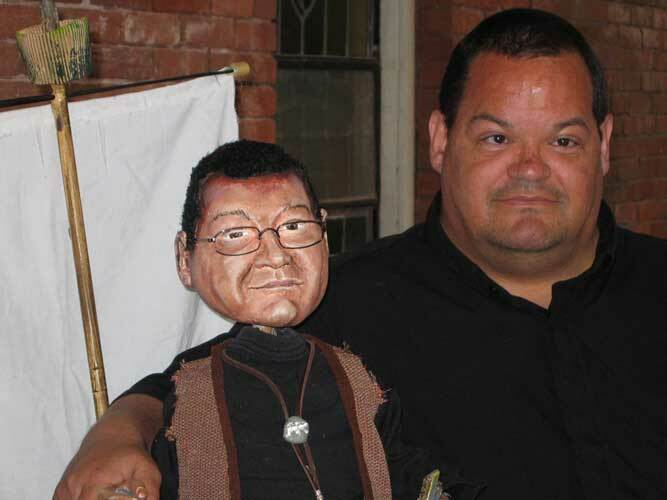 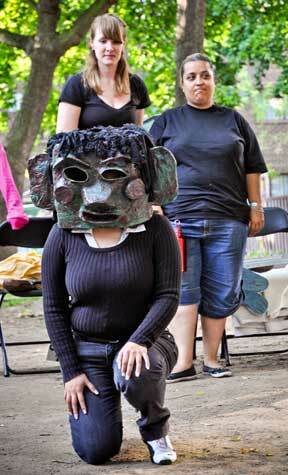 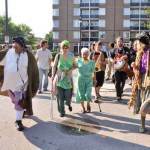 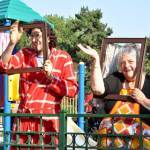 These activities included an oral history project (Davenportraits), a lantern parade at Pelham Park Toronto Community Housing, giant-puppet-making and more. 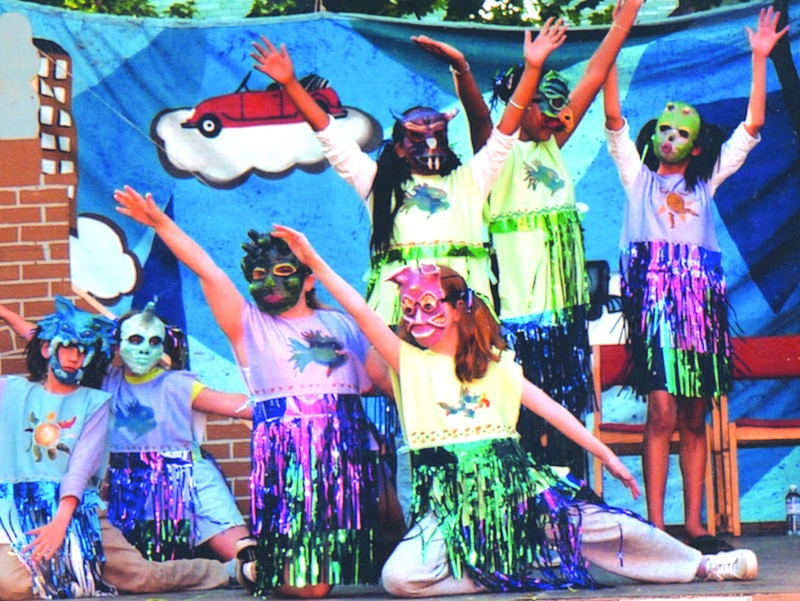 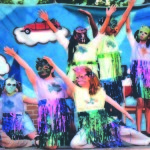 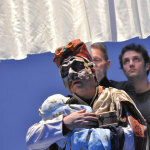 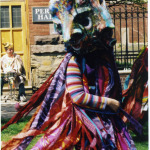 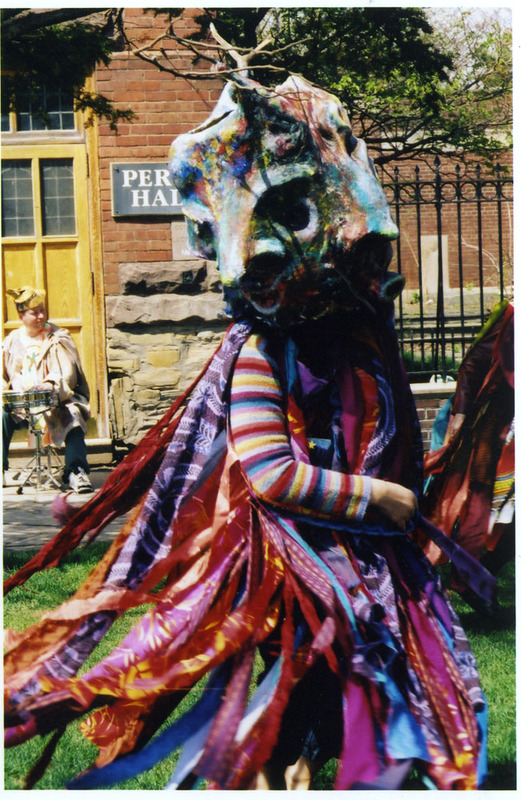 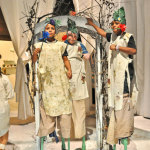 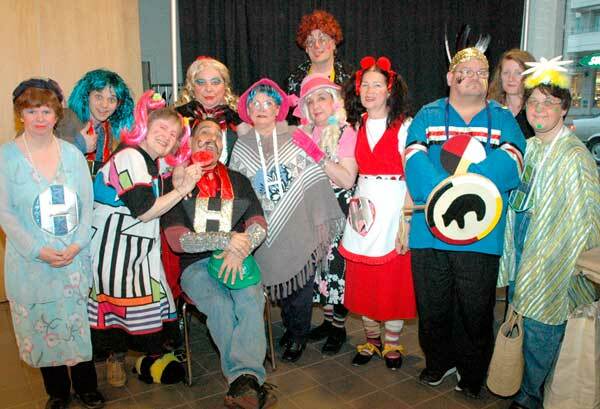 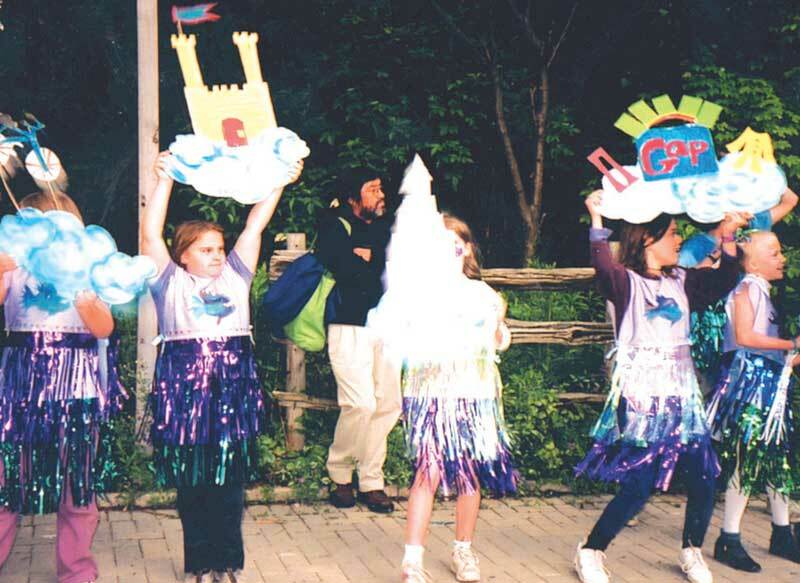 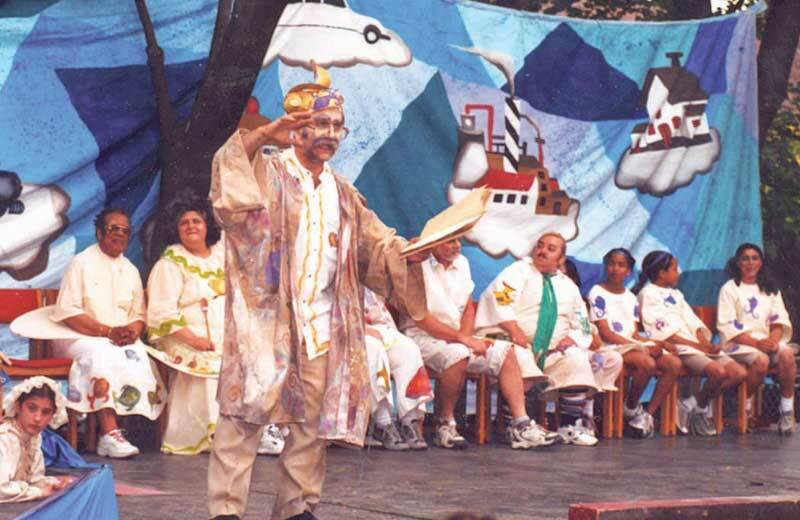 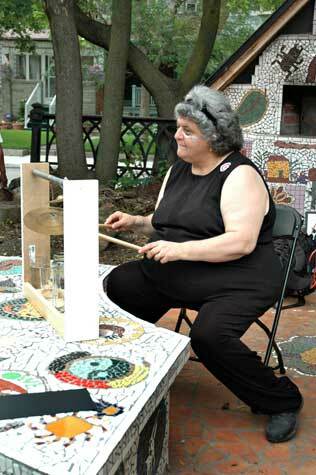 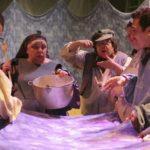 The finale of the first year of Arts For All was a week-long community arts festival including a street-parade, community arts exhibition, hands-on-activites and two performances of More or The Magic Fish, a theatrical banquet involving professional artists, community members in the hundreds, local history, an adapted Grimm’s tale and a four-course meal. 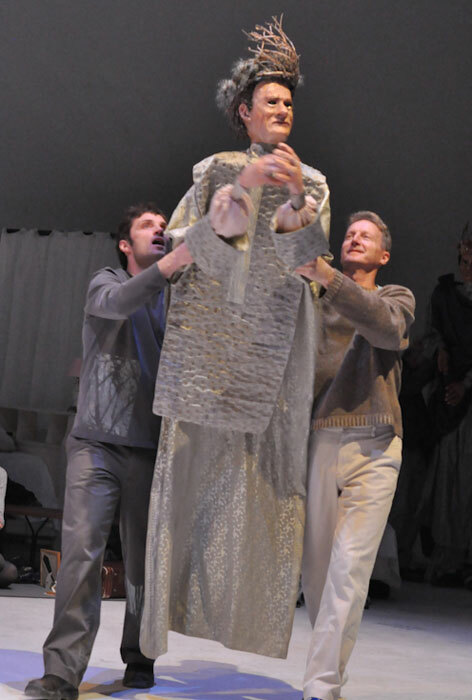 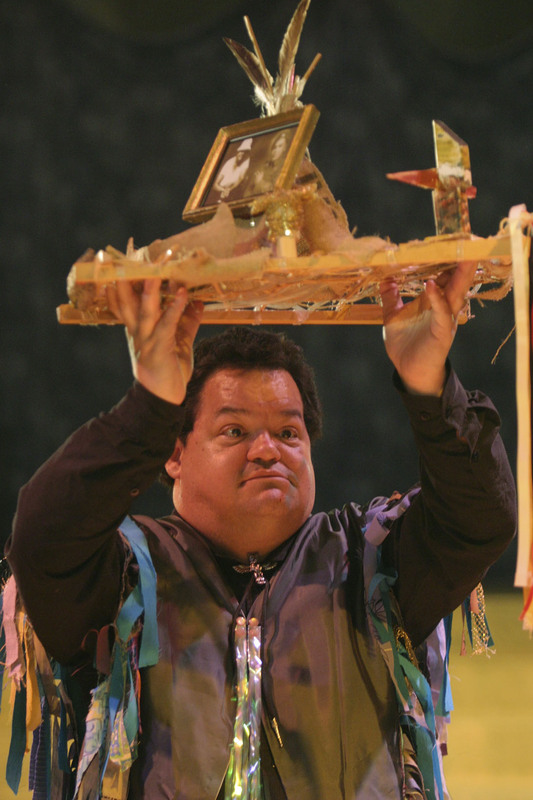 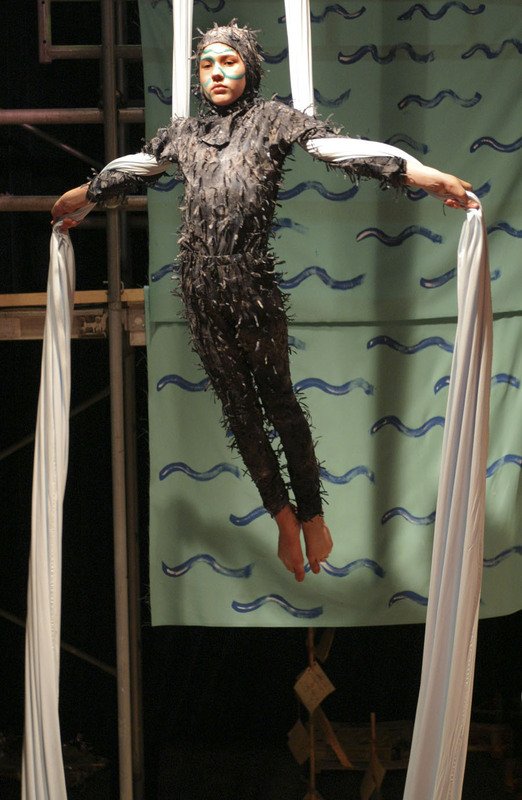 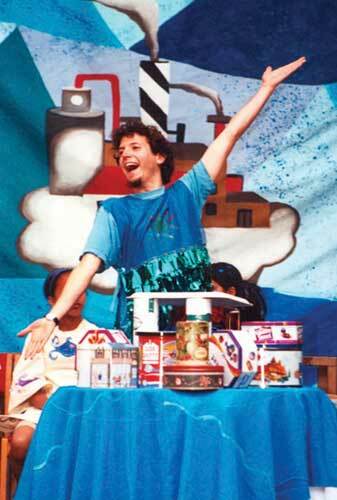 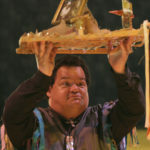 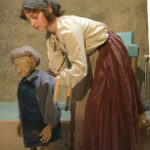 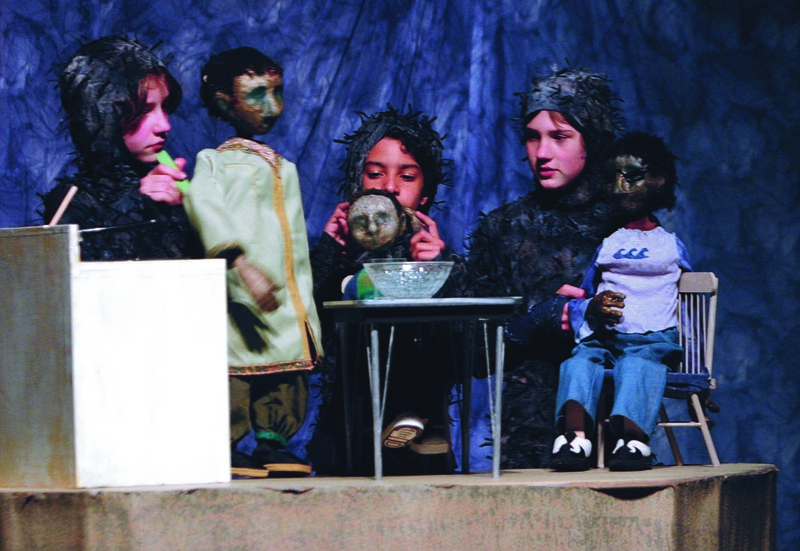 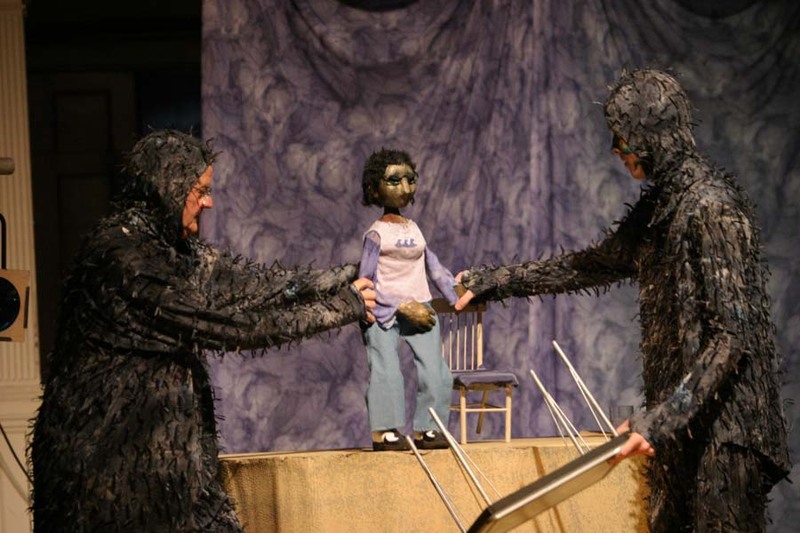 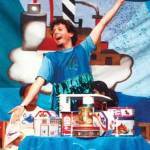 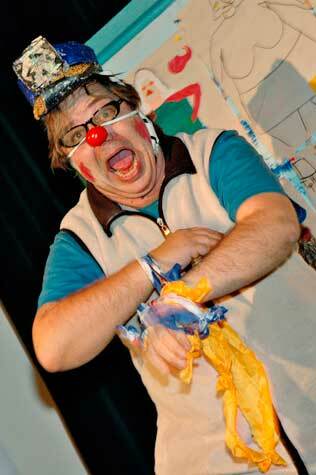 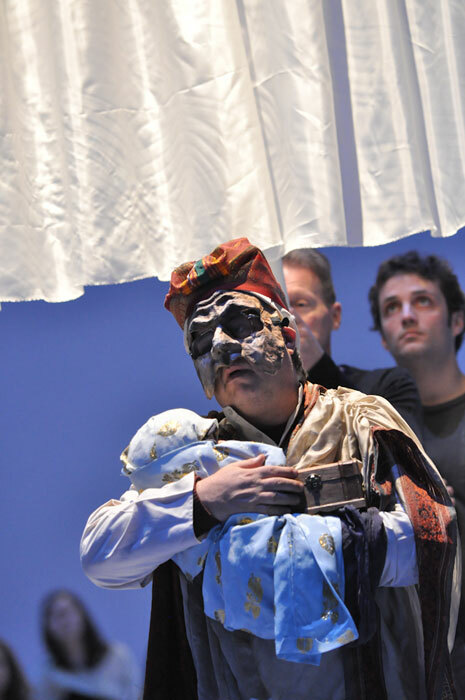 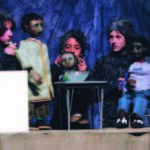 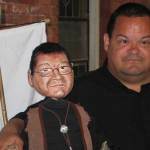 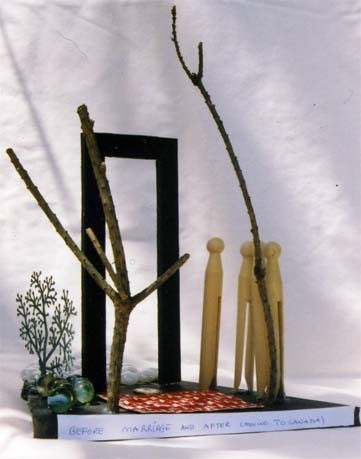 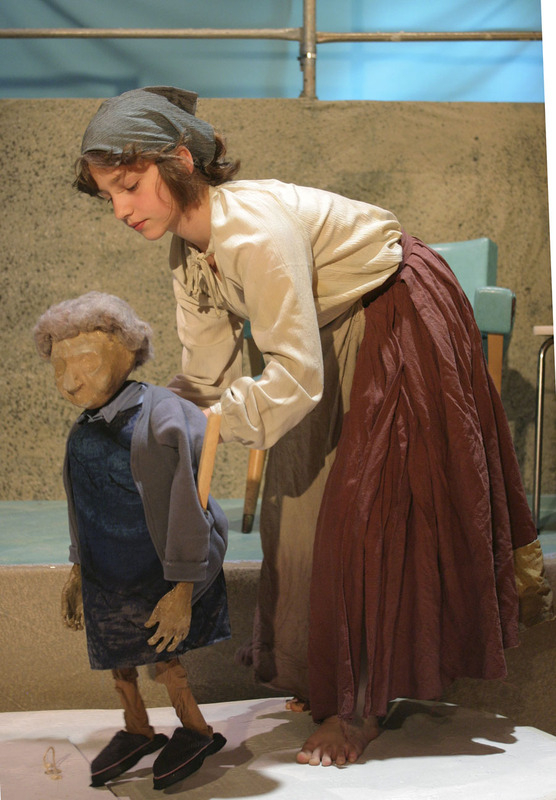 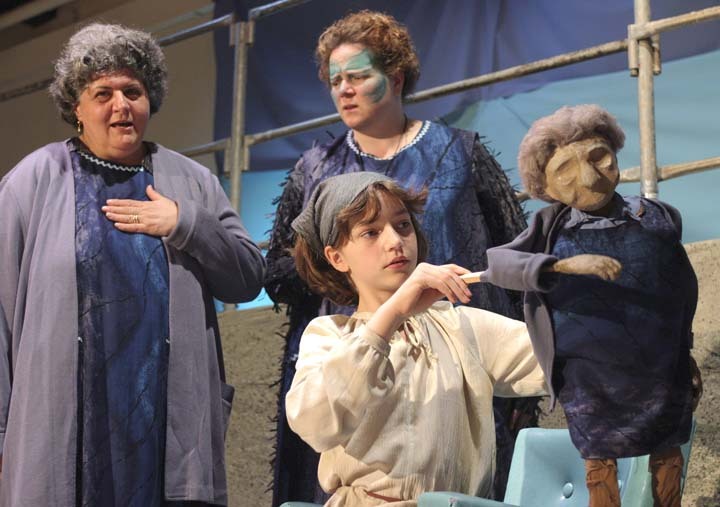 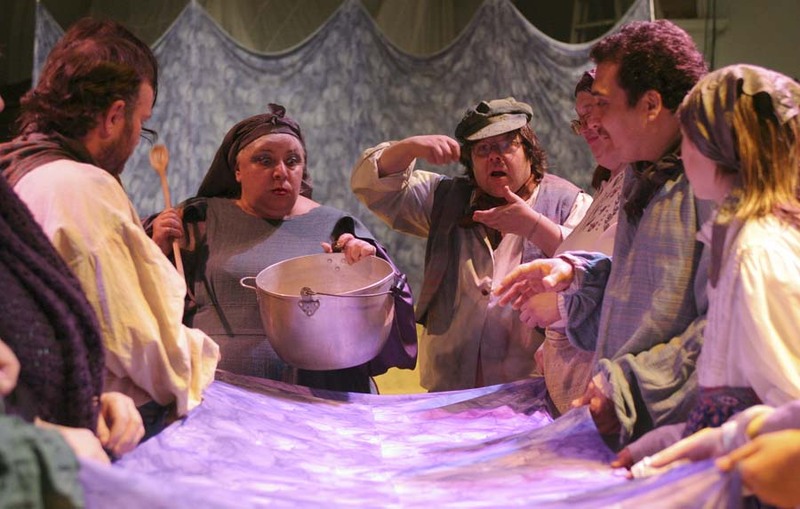 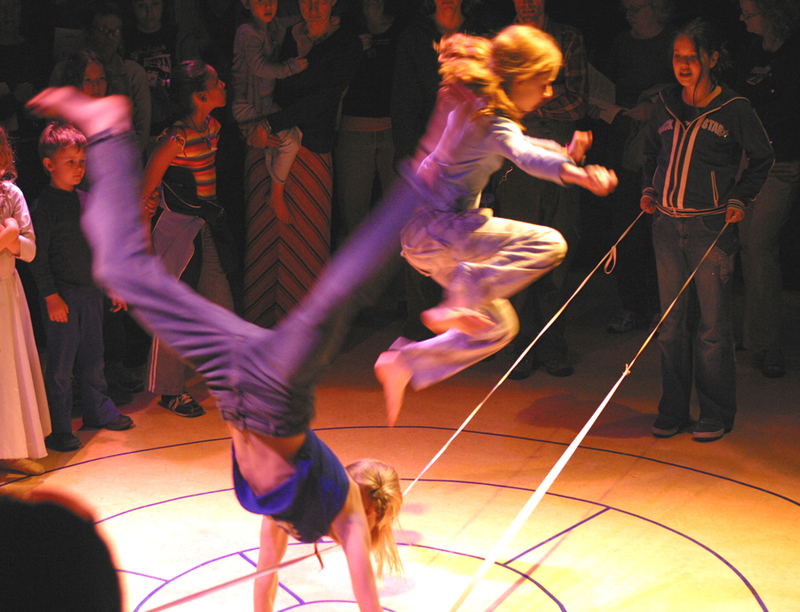 This production won a Community Arts Ontario 2002 Best Practices Award. 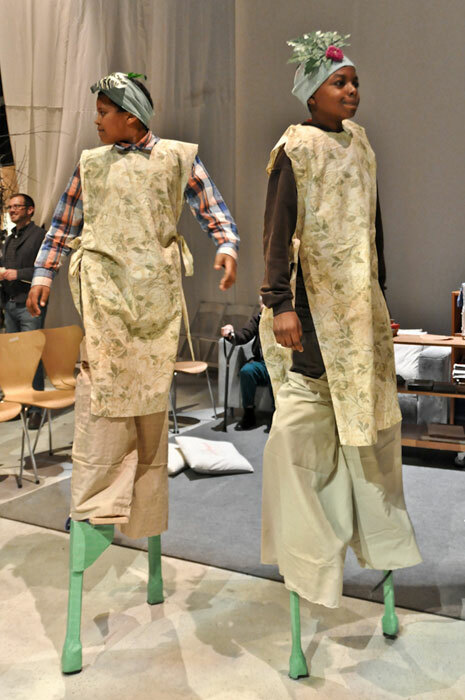 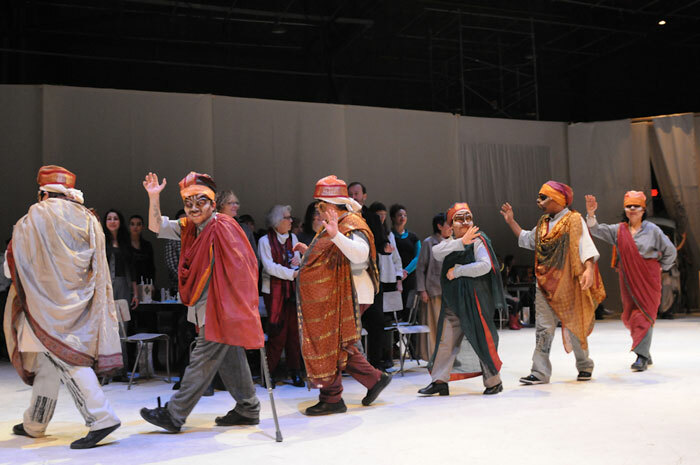 The 2nd year of Arts For All included an exploration of doors, entrances and transitions, which was presented in a multi-disciplinary one-day event in May. 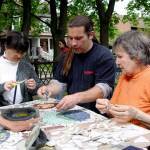 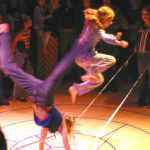 This event also served as a site visit for the Community Arts Ontario 2003 Conference: Kick It Up A Notch. Partners in Year 2, as well as DPNC, included the Stop Community Food Centre, the South Asian Women’s Centre, Pelham Park Housing, and several local schools. 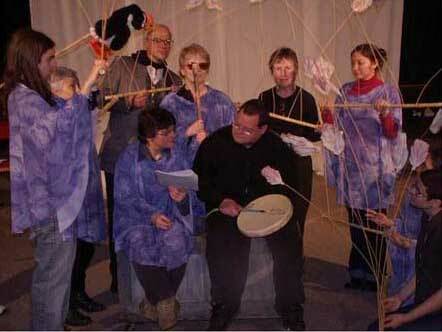 Once A Shoreline was the culmination of our three years residency at Davenport Perth Neighbourhood Centre and environs. 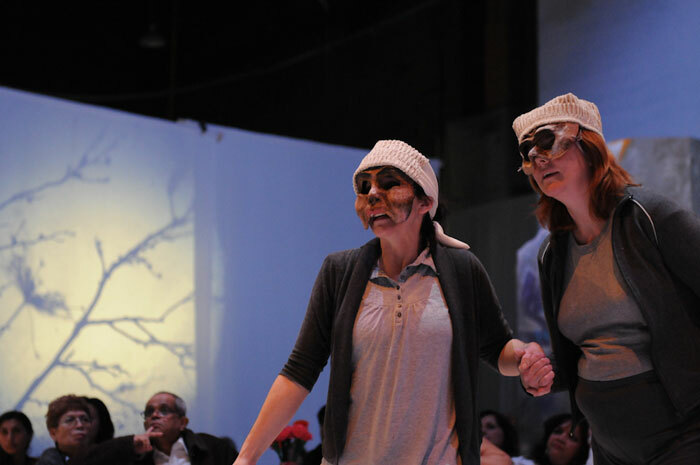 This music-driven theatre piece was inspired by oral histories from local seniors and many artistic workshops with community groups. 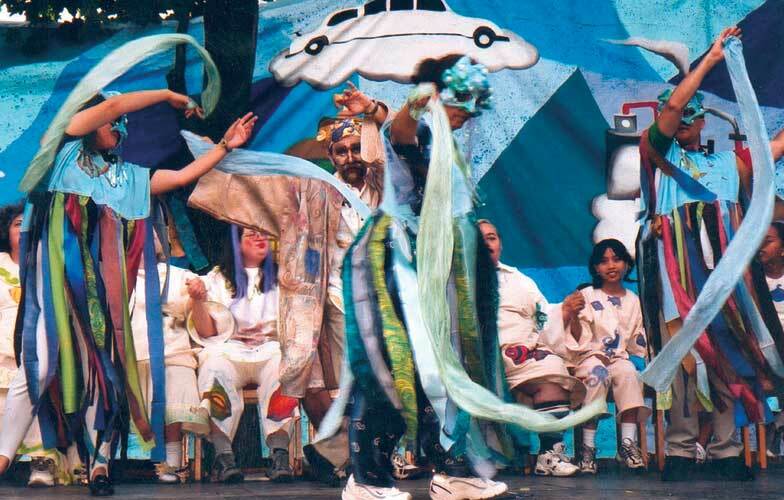 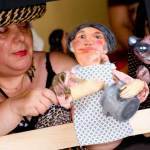 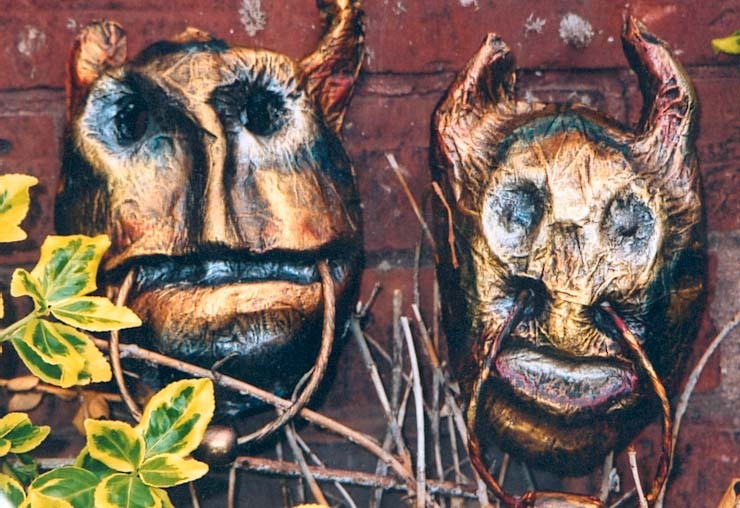 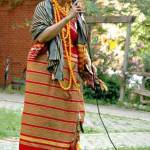 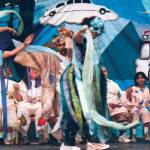 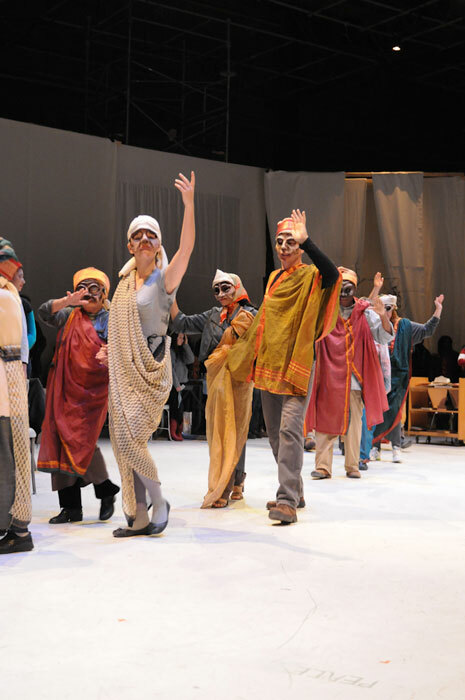 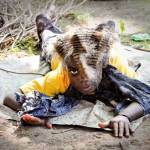 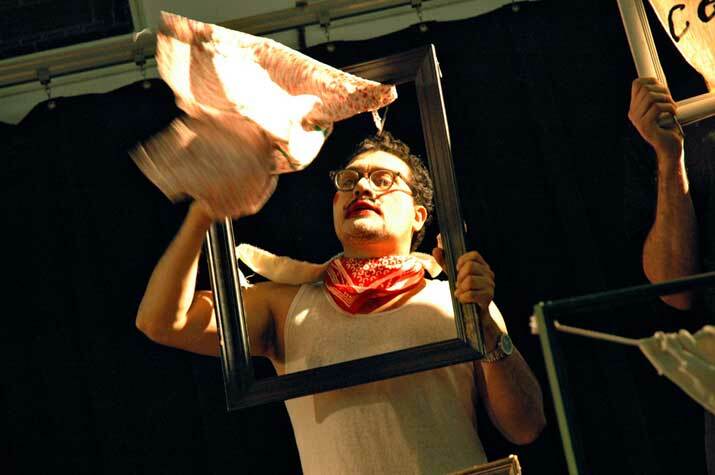 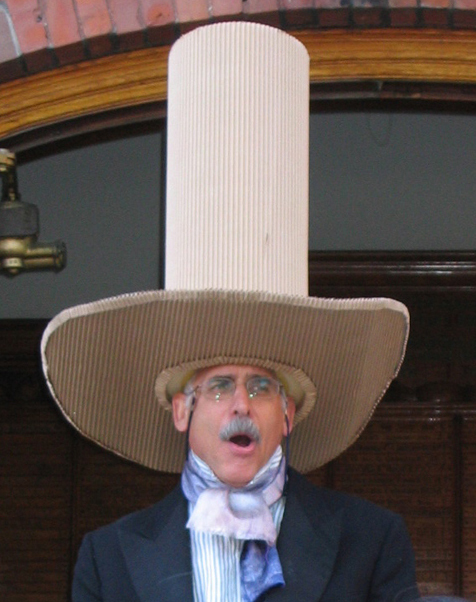 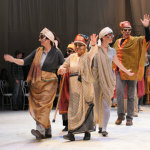 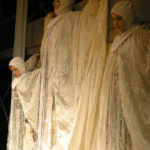 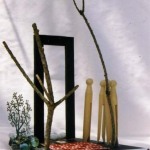 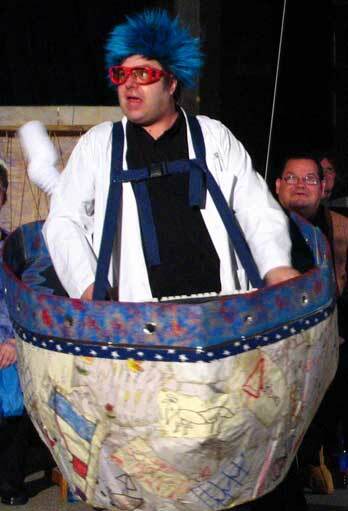 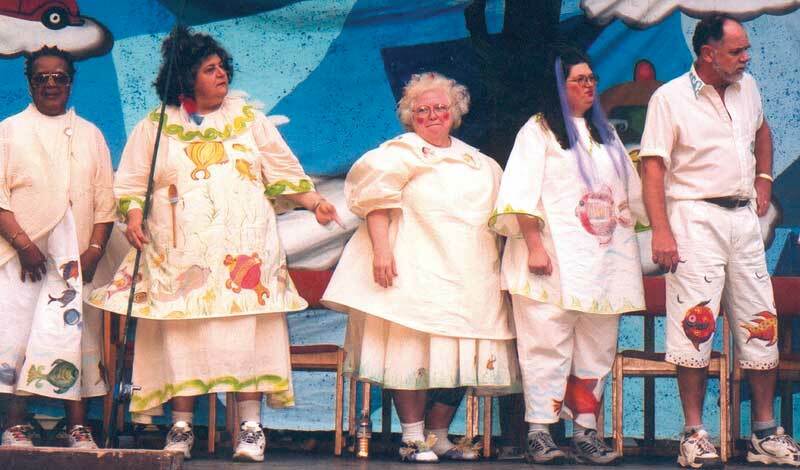 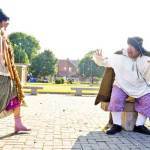 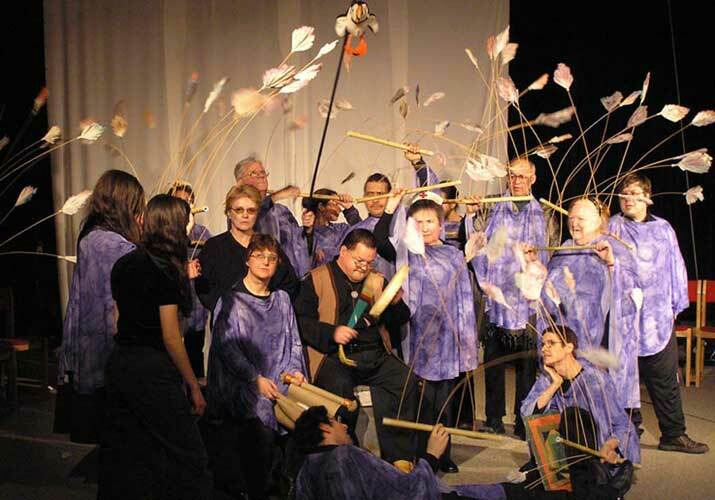 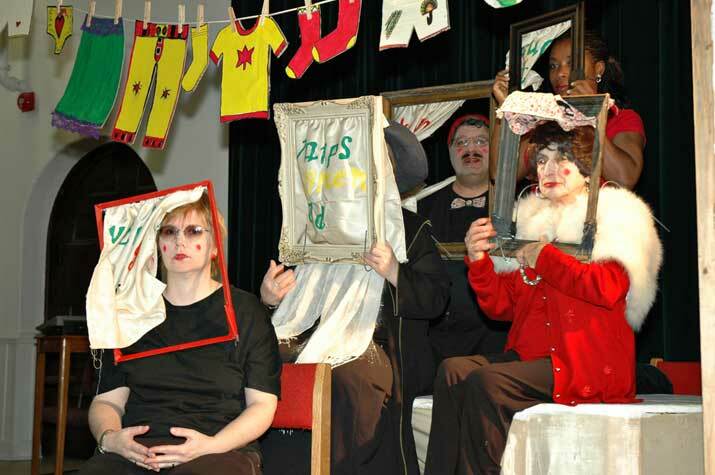 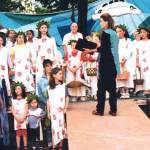 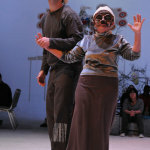 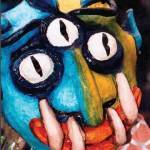 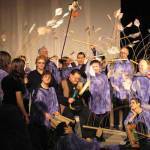 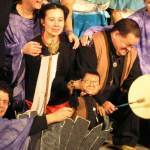 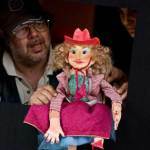 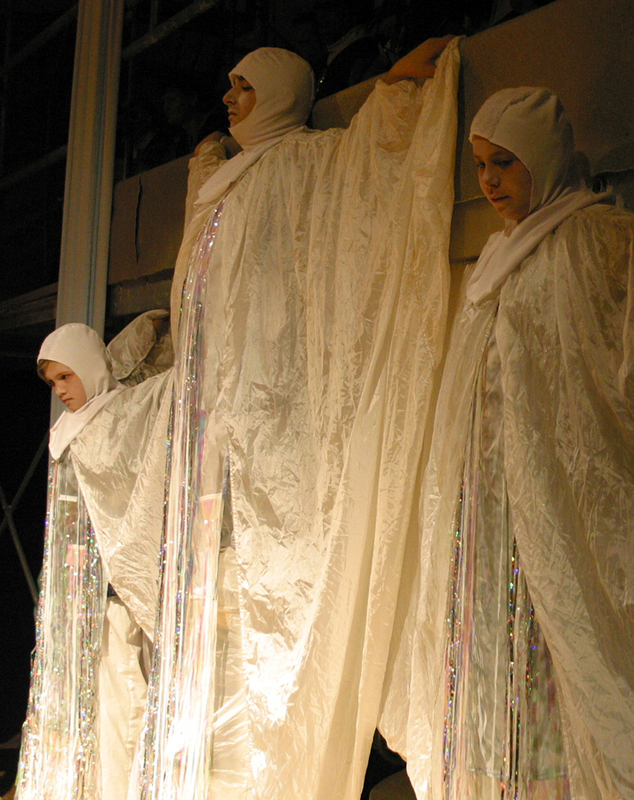 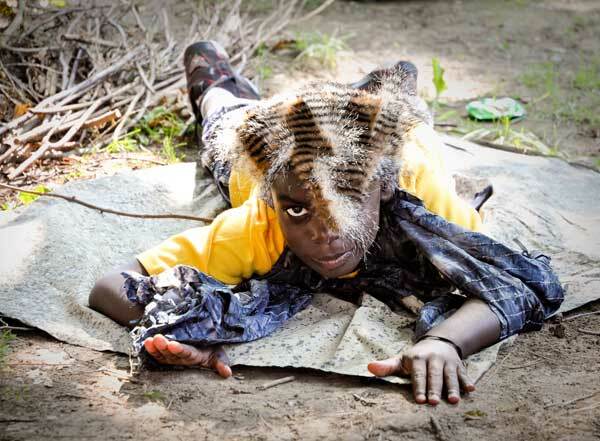 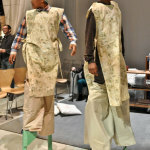 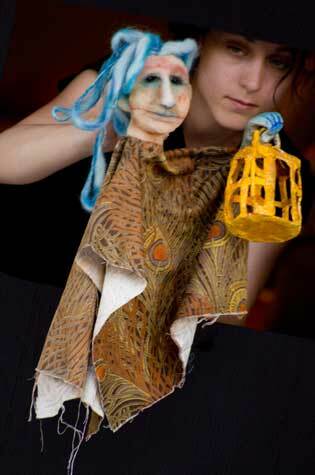 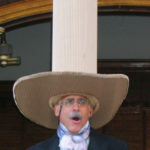 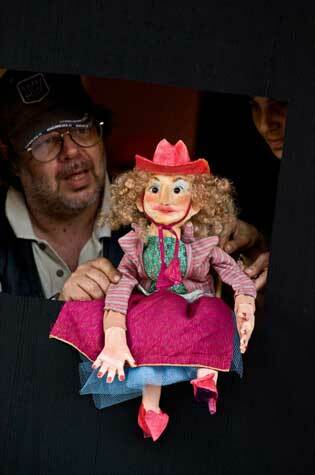 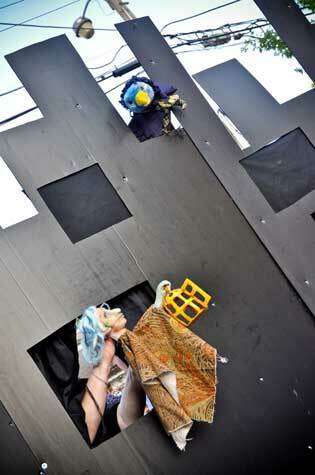 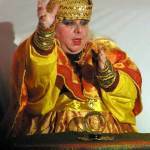 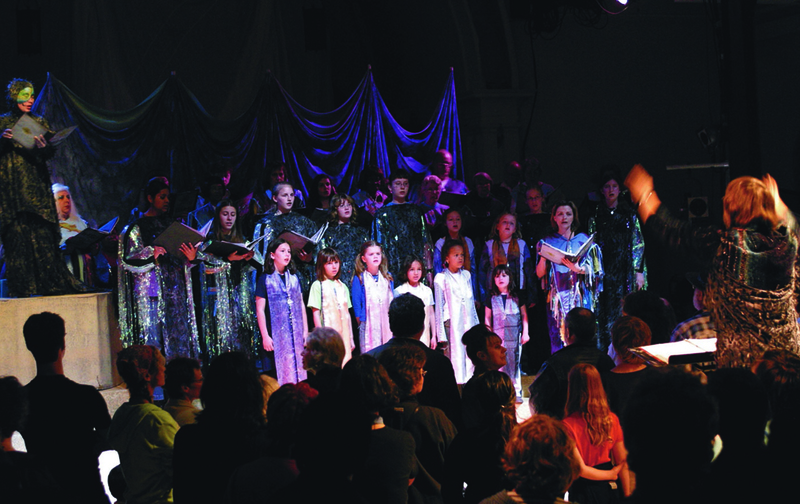 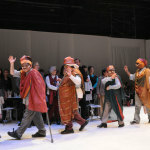 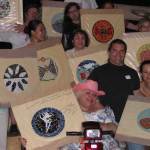 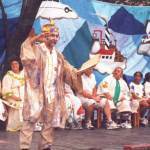 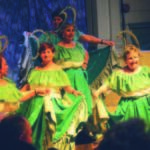 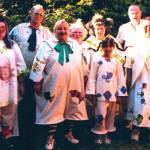 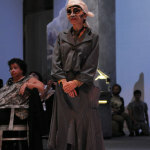 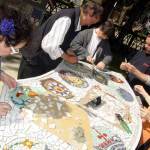 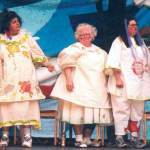 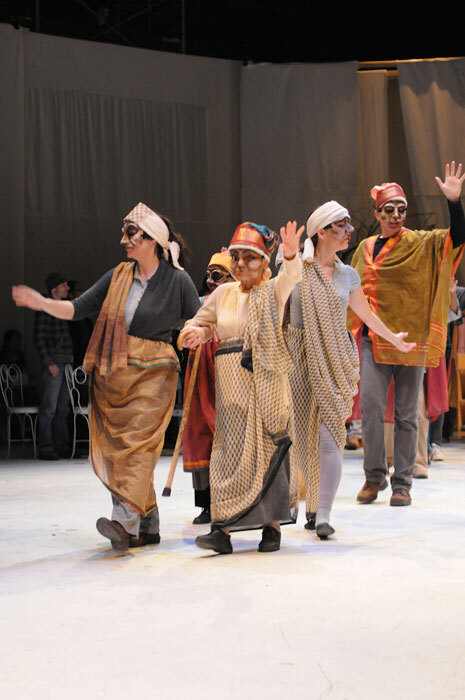 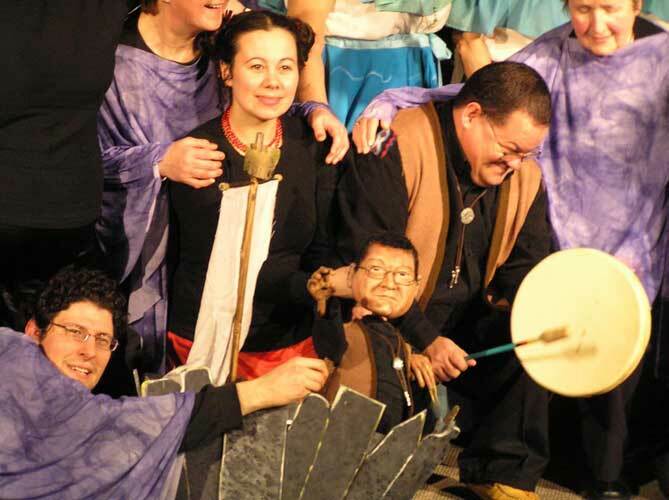 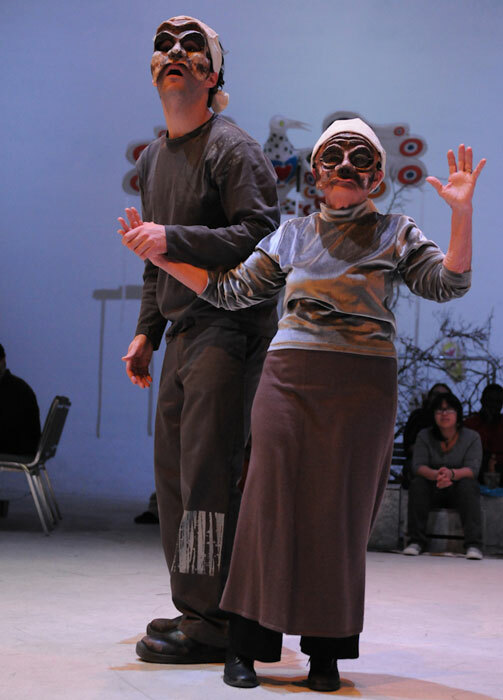 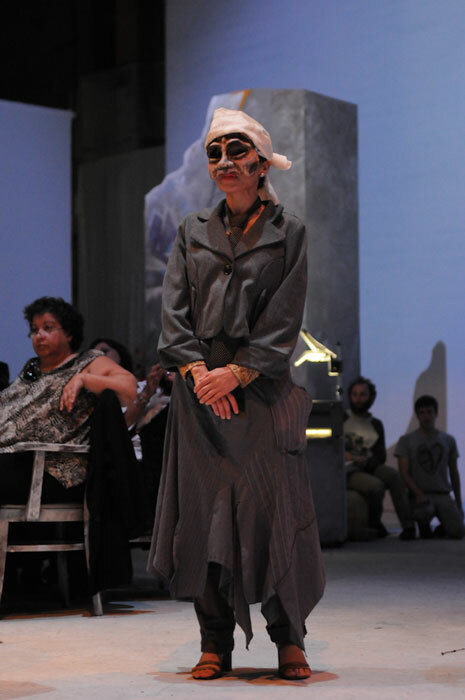 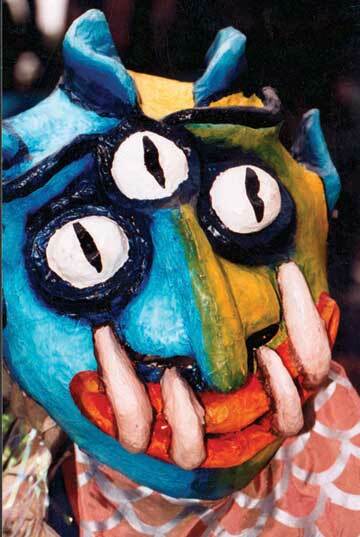 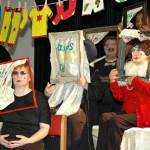 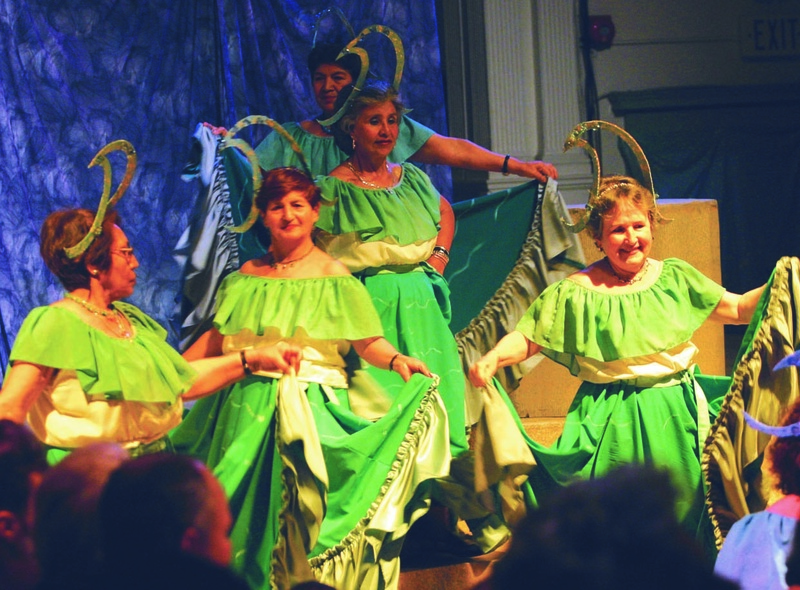 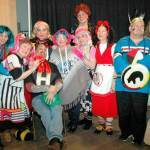 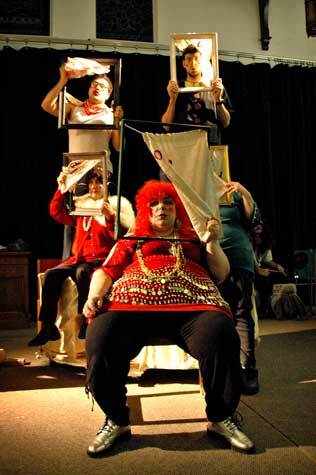 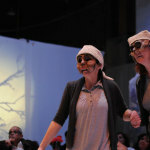 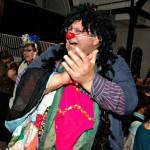 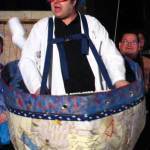 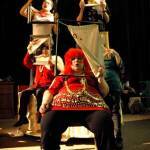 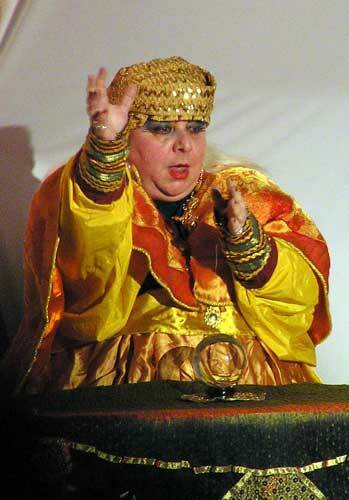 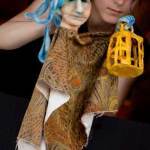 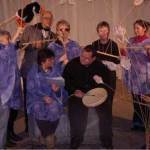 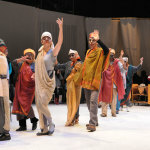 The production took place in May 2004 and involved professional artists and over a hundred community participants. 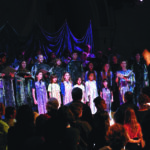 ARTISTS: Writer/Designer: Ruth Howard, Composer: Wende Bartley, Director: Varrick Grimes, Musical Director: Erna Van Daele, Other Artists: Chris Clifford, Noah Kenneally, Mara Shaughnessy, Tanya Williams, Antonio Ramirez, Angela Thomas, Kate Van Doorne, Jen Carter & VIVA! 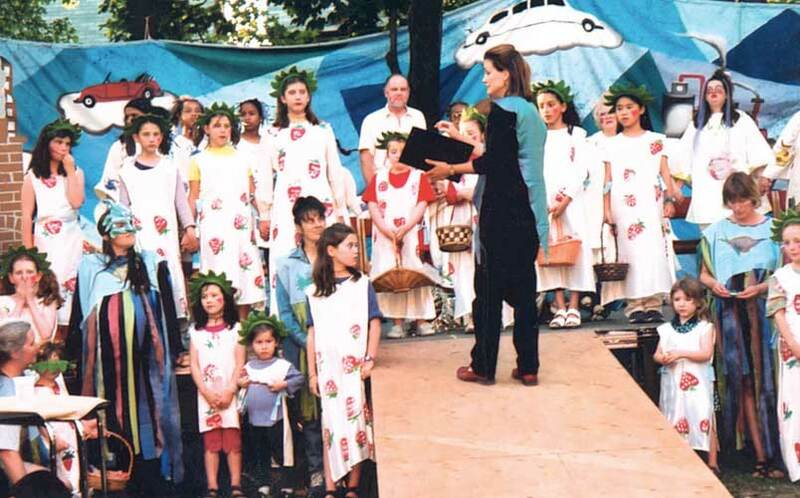 Youth Singers. 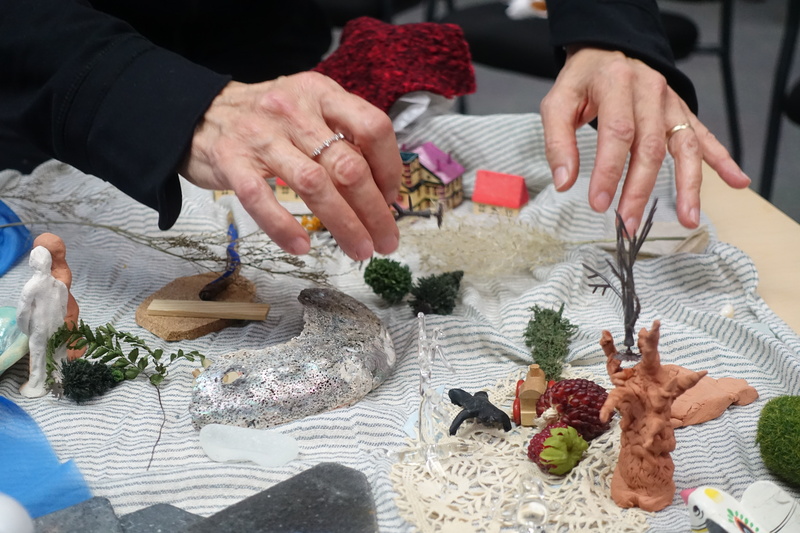 Following the production of ‘Once A Shoreline’, we entered into the Legacy Phase of the residency. 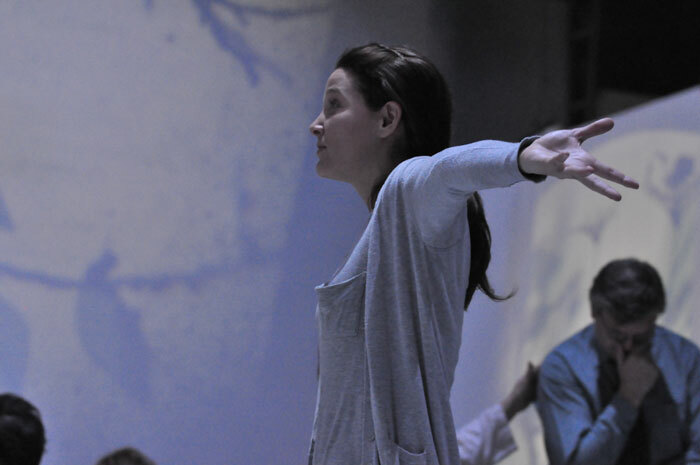 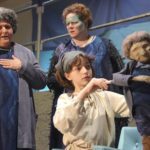 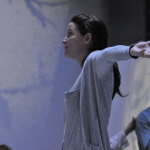 This involved supporting new leadership, activities and projects, including a theatre project exploring stories of names, leading to a theatre pieced entitled ‘Your Name Is Written In the Sky’. 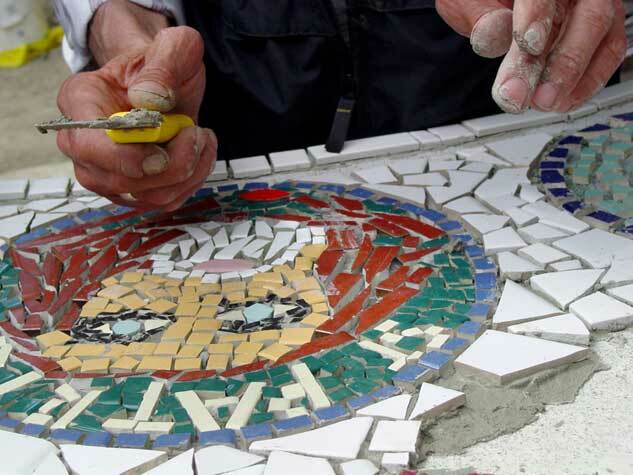 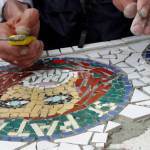 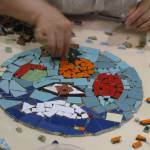 Another Legacy project was a mosaic project. 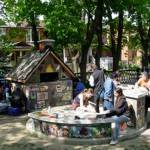 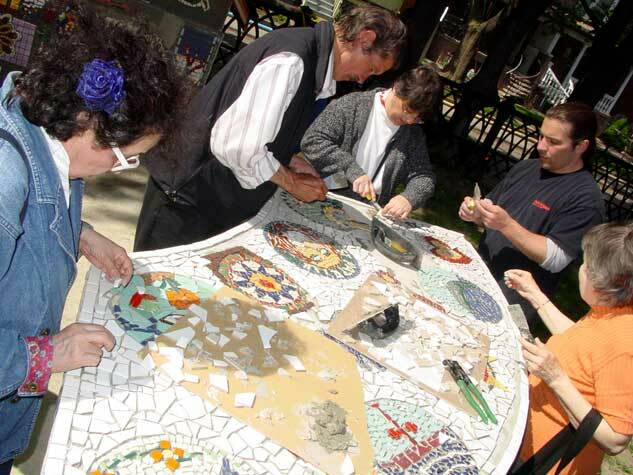 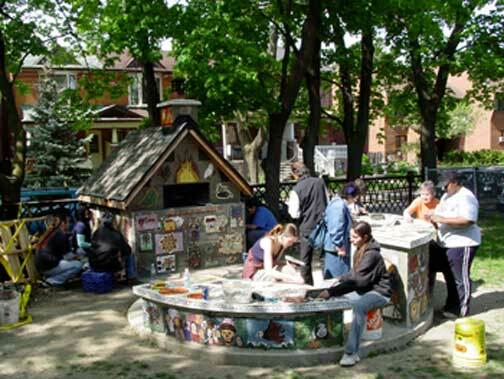 Red Pepper Spectacle Arts worked with community members at DPNC, The Stop and Carelton Village Public School to create a mosaic installation on and around the outdoor communal bake oven in Davenport Perth Neighbourhood Centre’s back yard. 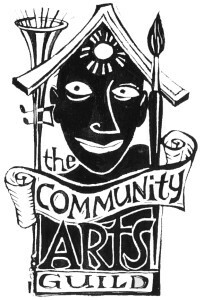 Following the Legacy Phase, Arts For All (with a new spelling – Arts4All), started to put down roots at Jumblies first independent Offshoot. 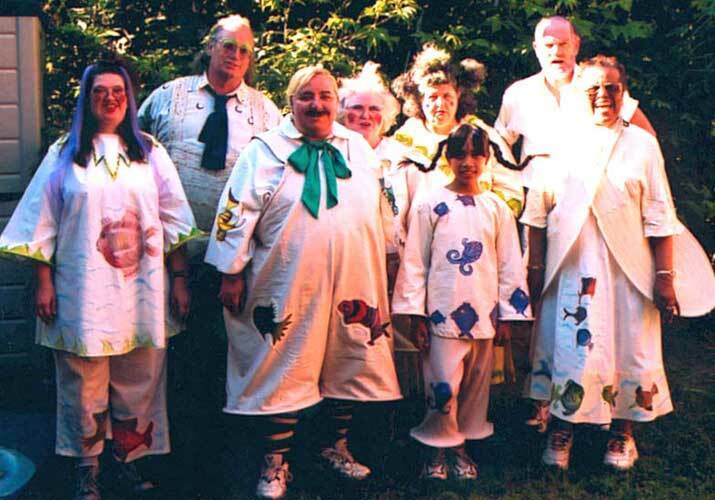 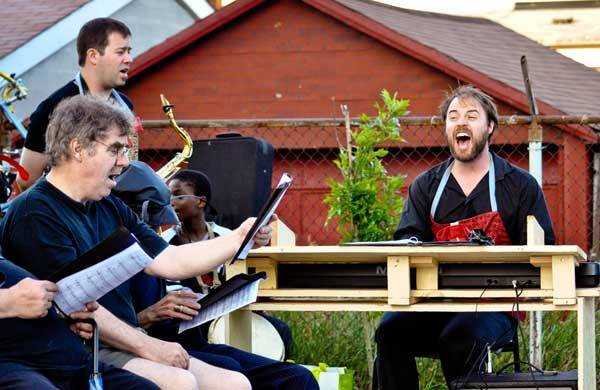 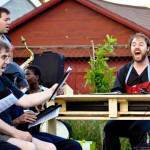 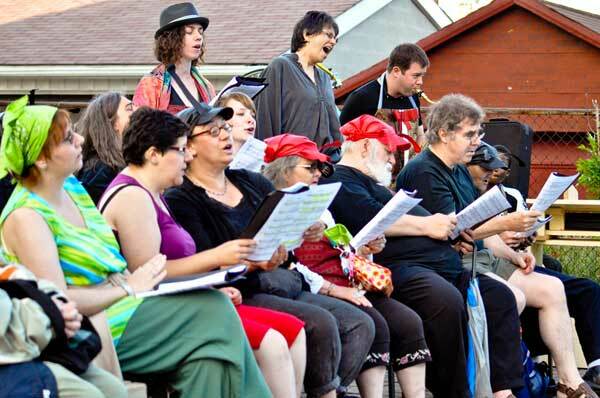 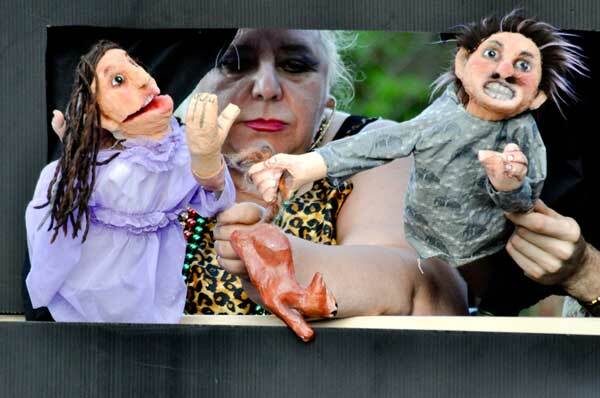 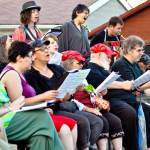 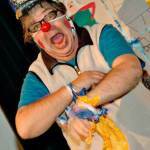 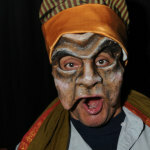 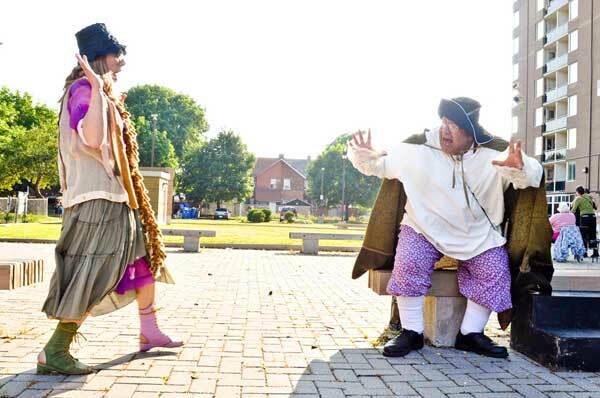 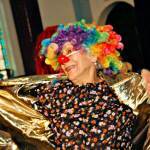 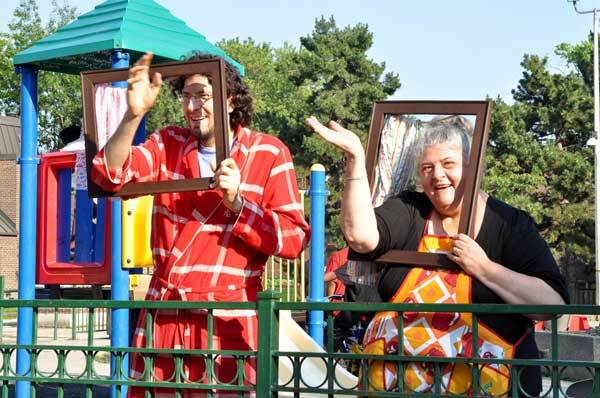 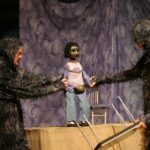 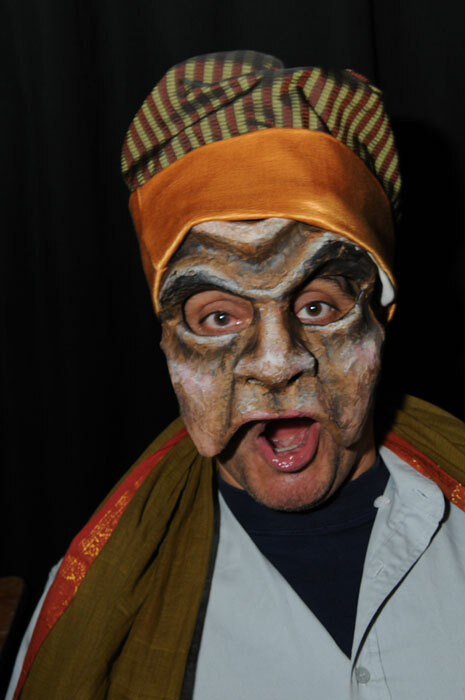 Under the Artistic Direction of Lisa Marie DiLiberto, they produced a series of work-in-progress showcases, exploring and combining clown, music and outdoor installation, and also took part in Jumblies’ Etobicoke production of ‘Bridge of One Hair’. 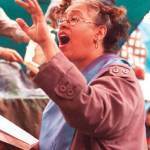 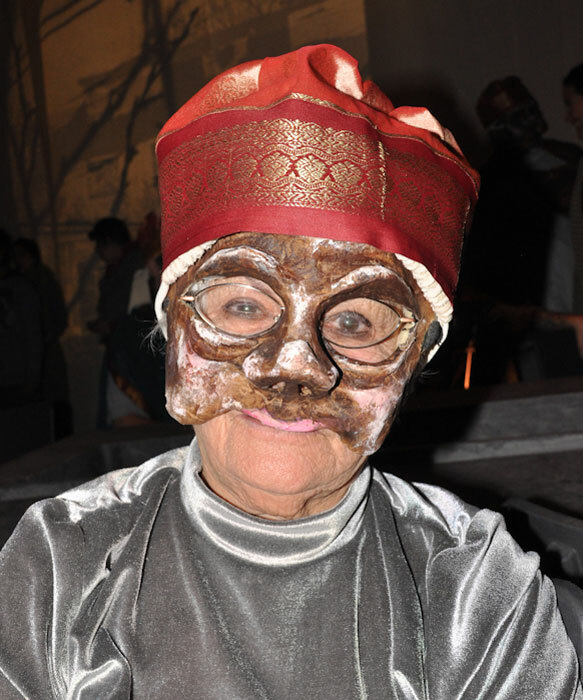 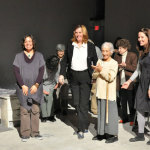 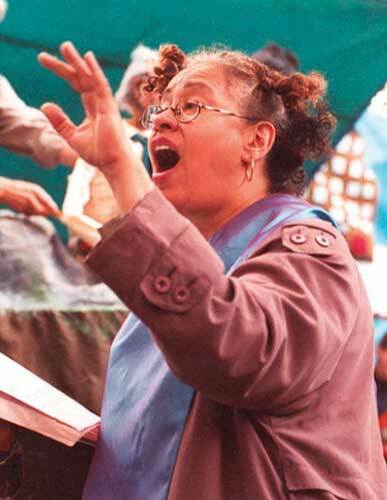 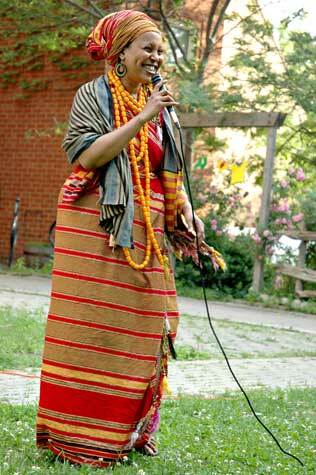 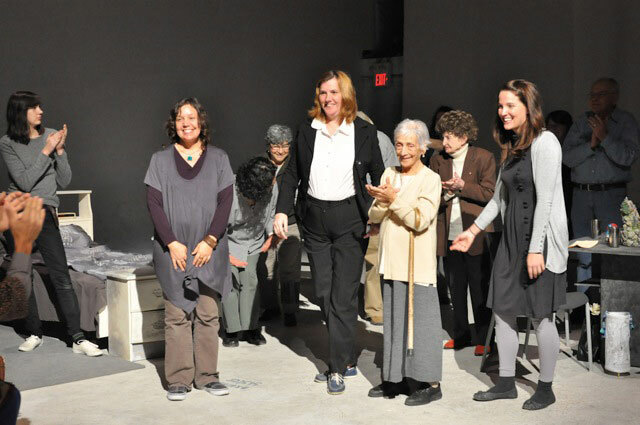 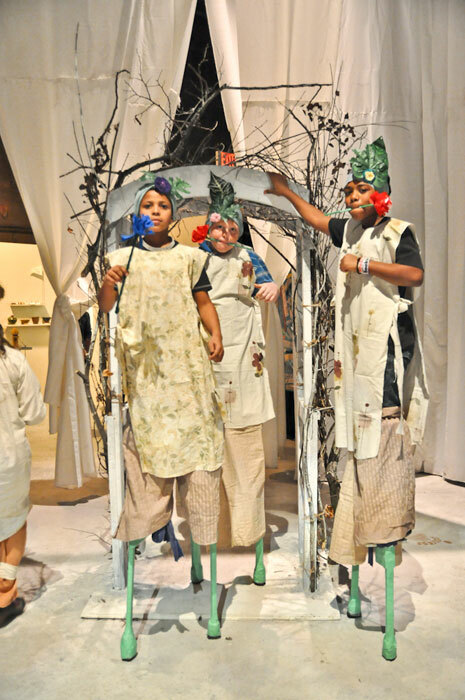 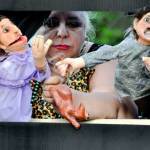 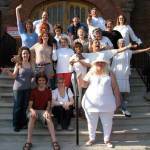 In 2009, the Artistic Direction of Arts4All was taken over by Elizabeth Rucker, who still holds that role today. 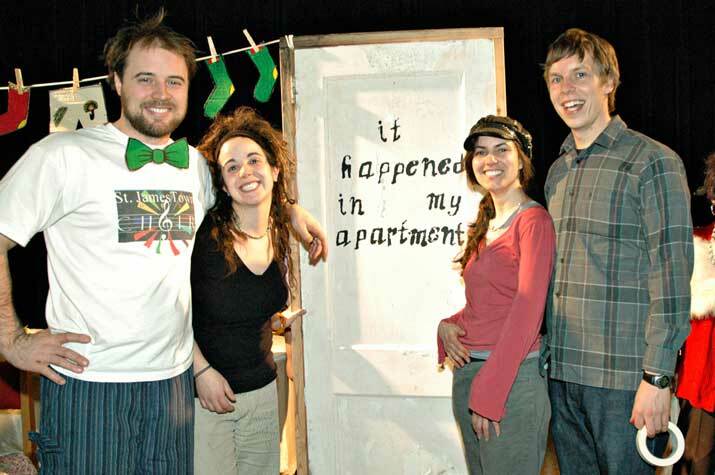 We Live Here was the culmination of 3 years work by Liz Rucker, Lisa Marie DiLiberto and Eric Schwindt, who met in 2006 as Jumblies Studio interns and formed the We Live Here Collective. 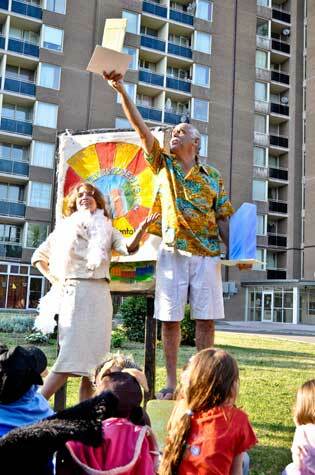 We Live Here was a lively, mobile outdoor play, combining puppetry, poetry, a noise orchestra, the Parkdale Choir, visual art and design, sound installations, and theatre to explore the adventures of living in the city, performed over 3 days, in the grounds of Pelham Park Gardens, a Toronto Community Housing complex, across the road from Davenport Perth Neighbourhood Centre. 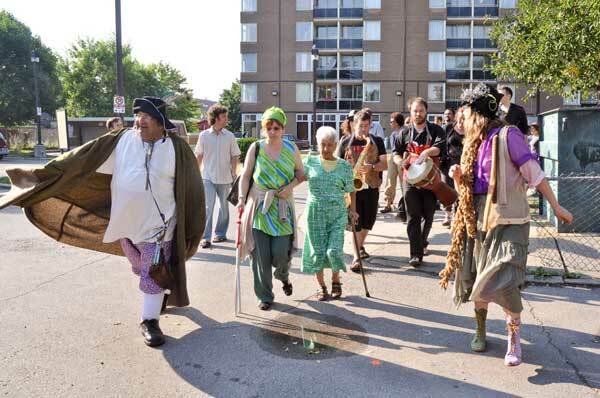 Musicians: Treasa Levasseur (Accordian), Steve Bijakowski (Saxaphone), Eric Schwindt (Percussion), The Parkdale Singers. 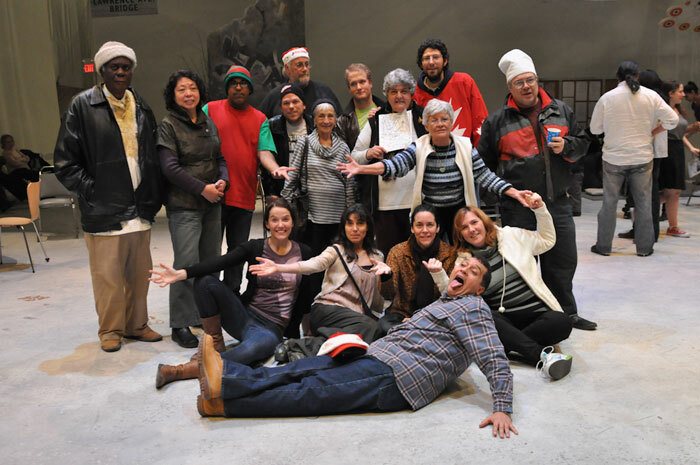 Cast: Edmond Chano, Laura Szilagyi, Iole Bianchi, Tiina Leivo, Diana Giardino, Charlie Murdoch, David Bishop, Keith McNair, Emma Manchester and many others. 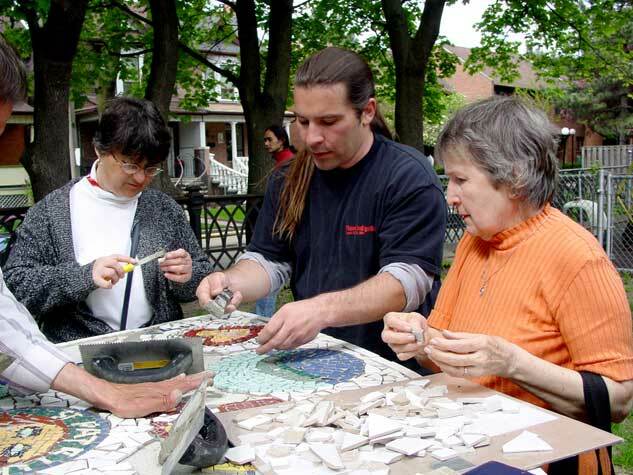 Funded by: the Social Investment Fund (TCHC), the Ontario Arts Council, the Toronto Arts Council, the Ontario Trillium Foundation, Canadian Heritage Celebrate Canada, the George Cedric Metcalf Charitable Foundation. 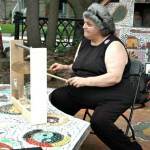 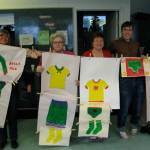 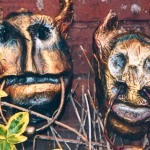 To find out more about Arts4All and their current projects, visit their own website or Facebook.